Have I told you all how much I love my church book group? We meet every week and have extremely lively discussions of books that deal with different aspects of the Christian life. Even when the books aren’t so great, we have wonderful conversations about the ideas in them. We don’t always agree, but we make one another think, and that’s one of the great pleasures of a book group. Another great pleasure of being in a book group is being encouraged to read (or in this case, reread) books I never would have picked up. I read The Great Divorce by C.S. Lewis several years ago, and it just didn’t do much for me. I don’t know what the problem was, but I scarcely retained anything about it, other than that I found it confusing and not helpful at all. Rereading it with my book group this month has me even more puzzled as to why I didn’t love this book the very first time through. I certainly loved it this time. 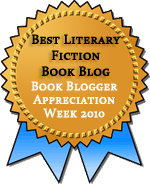 Jenny’s review from her own reread two years ago will give you a good idea of what this book is about, so I’ll refrain from sharing much in the way of summary. 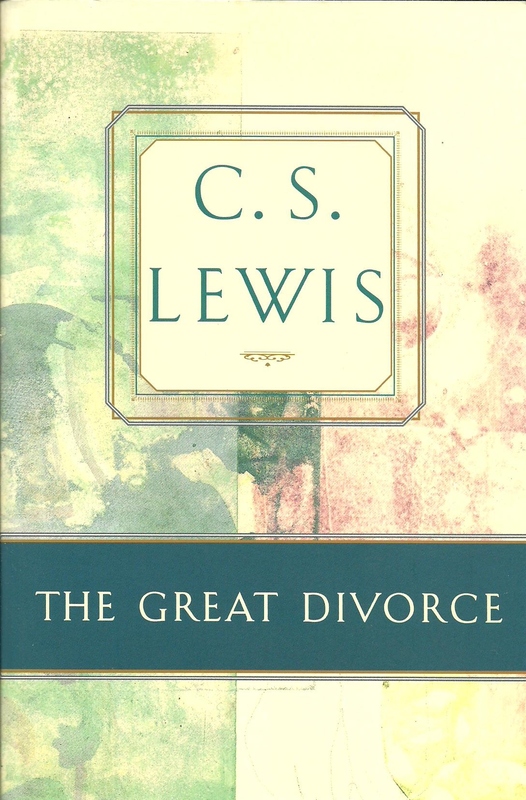 It’s enough to say that The Great Divorce is an account of Lewis’s dream journey through hell (or perhaps purgatory) and into heaven—or at least heaven’s narthex, as one of the members of my book group observed. Lewis travels to heaven with others who are given the opportunity to stay or to return to the grey “hell” they came from. The choice is more difficult than you might think. One of the most striking things about heaven in this book is that it is more solid, more real than anything the people have previously experienced. The grass is so solid it hurts to walk on it; the rain would pierce you right through. Heaven is not some spiritual realm, where matter is no more. Matter is more substantial than ever. It’s a wonderful way of showing, in contrast, just how insubstantial our day-to-day concerns are when we consider eternity. The ghosts that Lewis observes trying to make this momentous choice represent a variety of types. There’s the nagging wife, the constant grumbler, the forward-thinking intellectual, and the artist who has come to love his painting itself more than he does the things that he paints. All are recognizable, and I chuckled to think of similar “types” I’ve known in my life, and then I winced to see glimpses of myself among them, too. Some of the characters’ excuses and evasions were familiar not because I’ve heard them, but because I’ve said them. Lewis has my number all right. This entry was posted in Religion, Speculative Fiction. Bookmark the permalink. Your book club sounds wonderful! The best ones have great discussions. It is a wonderful group–and we even manage to focus on the book (almost) the whole 90 minutes we meet. This is one of my very favorite of Lewis’s books. I read the description of the heavenly woman (the one who tries to convince her husband to stay) at my grandmother’s funeral, because it described her so well. What a wonderful passage for a funeral. That was a lovely description. My personal favorite part was the lizard–the dialogue with the angel cracked me up, and the completely unexpected (to me) result took my breath away. Your review and then Jenny’s make me think that I need to read this again, to see what I missed. Like you I found it rather confusing, compared to The Screwtape Letters, one of my favorite books. I’ve been wanting to re-read Surprised by Joy as well, because when I first read it, all I knew of Lewis was Narnia and Screwtape. I’m glad I’m not alone in having found it confusing the first time, although one this second read I can’t for the life of me figure out what was difficult about it. Maybe it helps to read it once to see where it’s going and then go back and pick up the ideas within it? Surprised by Joy is one I’d like to reread as well. And Till We Have Faces is my absolute favorite Lewis. I’m not religious at all. Nonetheless I find such comfort in the religious works of CS Lewis and I’m always recommending him to churchgoers in my country. Screwtape is one of my favorite books. I also found The Great Divorce a bit more involved and had to read it twice to appreciate and understand it. Thanks for the review. That’s so interesting, Kinna, because I know a lot of nonreligious people who are put off by Lewis’s religiosity. I think, though, that he has a lot of keen insights into human nature that could speak to anyone. Parts of it are indeed very funny. The characters are so recognizable! It’s a quick read too, so worth the time to revisit.